The Archery Game in the Ranging Guild is the place to go if you're looking for Ranging Experience and prizes for the points you make. Just remember, the game can be found in the Ranging Guild, so you'll need at least level 40 Ranging to enter! 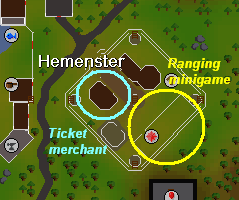 The Ranging Guild itself can be found a short distance southwest of the Seer's Village and north of Ardougne. A Ranging Guild Doorman will be guarding the door, and only those with a Ranging level of 40 or higher may pass. It also appears that the higher your Ranging level, the better you'll do at the competition. You'll hit the targets more often, and you'll earn more points by being more accurate. Before making your way to the competition, be sure to bring enough cash. Each game costs 200gp, and you'll need to pay each time you want to play again. It's a safe bet to bring around 2,000gp, as the game can often get addictive! At the southeast end of the guild, you'll find the Archery Competition. 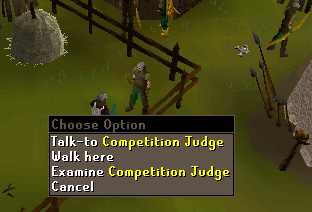 Speak to the Competition Judge and he will tell you that you can take part in the Archery Competition. You must pay 200gp in order to enter the competition each time, so be sure to bring as much money as you need! Tell the judge that you would like to try, and then give him the 200gp. He will give you 10 Bronze Arrows to use in the game; equip them and walk over to the nearby Hay Bales. Now you'll be able to shoot at the Targets by choosing the "Fire-At Target" option on the one you wish to fire at. 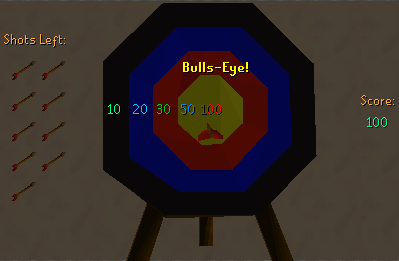 You'll then aim and shoot an arrow at the target, and after a short period of time the Target View will appear. You can only use 10 arrows, and when you have used them all up return to the Competition Judge. He will give you a certain number of coupons or Archery Tickets depending on how well you did during the competition. For every 10 points you get, you'll receive 1 Archery Ticket. So for example, if you score 780 points, you'll receive 78 Tickets. The maximum number of points you can get in a single game is 1,000, but you must be an experienced Archer to accomplish this. You can repeat this process as many times as you'd like, but you must pay 200gp each time you wish to play. When you have enough Archery tickets, you'll be able to exchange them for various Ranging items and equipment. Speak to the Ticket Merchant to the northeast and you can trade your tickets in.